Metro's ridership has fallen precipitously since 2009. Empty Metro Car by Mr.TinDC licensed under Creative Commons. Metro’s ridership continues to suffer after years of reliability problems. While the system’s losses seem to be slowing, Metro’s ridership is well below its 2009 peak. With just shy of 300,000,000 unlinked passenger trips in 2009, Metrorail had more than twice as many trips as Metrobus did a decade ago. Ridership trends for the two services diverged from that point, with Metrorail’s ridership steadily decreasing until 2015. Metrorail’s losses then accelerated, coinciding with SafeTrack in 2015 and 2016. Looking at a month-by-month basis, Metrorail’s ridership shows a stark contrast between 2015 and subsequent years. The beginning of the graph, January 2015, is the same month that smoke from a fire at L’Enfant Plaza station killed one person. By mid 2016, when WMATA started SafeTrack, Metro’s number of trips was already visibly below 2015 levels. The passenger trips trends in 2017 and 2018 closely resemble the 2016 levels. 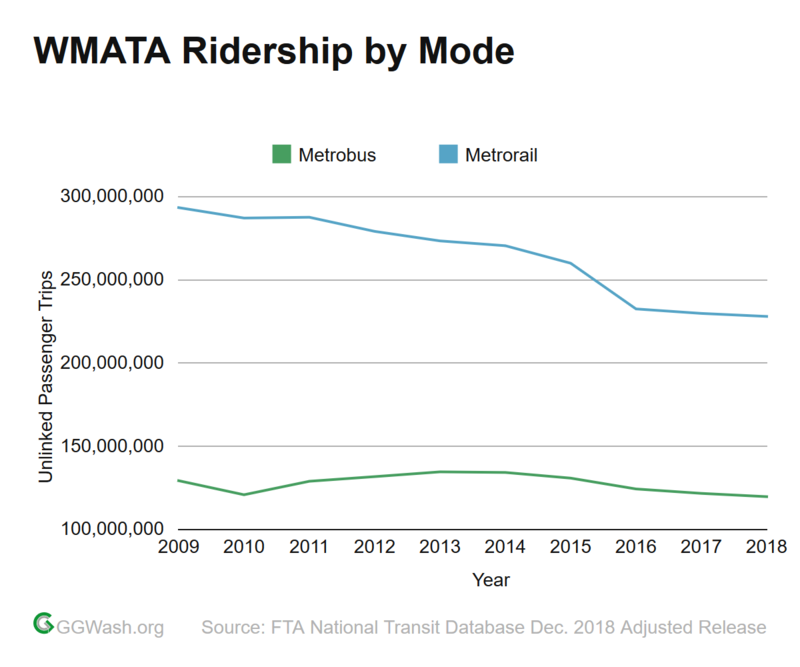 Metrobus’s number of passenger trips has also sagged in recent years, but not by nearly as much as Metrorail. The graph below shows many more ups and downs than Metrorail’s numbers, with a particularly steep drop in September 2018. Metrobus’s passenger trips actually increased until 2013, and then declined. Although the decline in bus trips was less severe than rail trips, Metrobus still underperformed versus other major agencies in recent years. In comparison to other urban rail systems, Metrorail’s decline in passenger trips over the last decade is unparallelled. 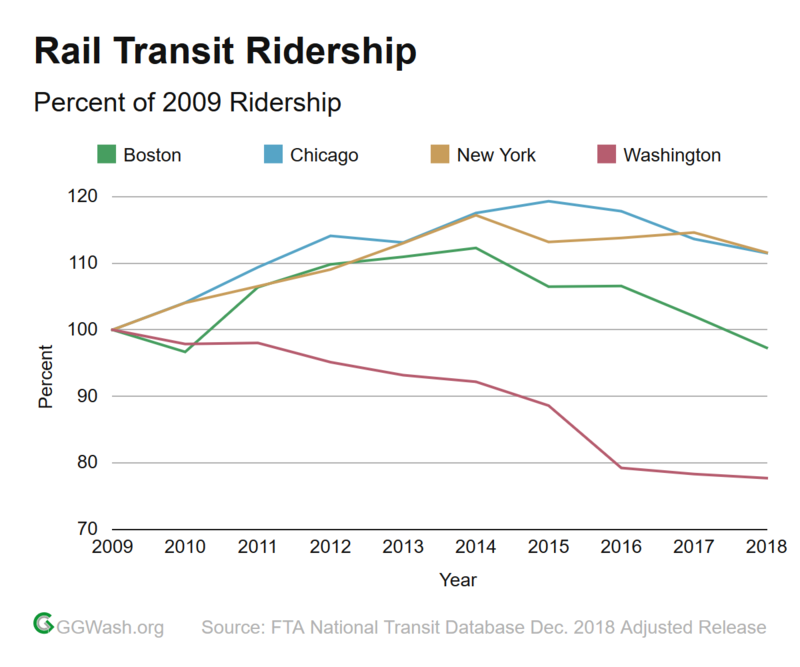 Among the four busiest urban rail systems nationally (excluding commuter rail), Boston’s MBTA was the only other one with a decline in passenger trips versus a decade ago. 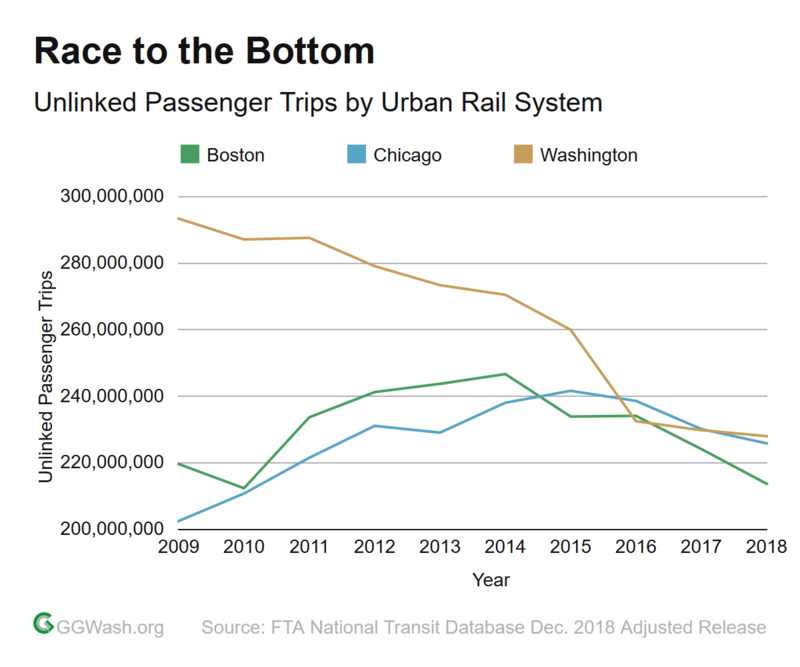 Even then, that is largely because this graph includes both MBTA’s heavy and light rail trips; during recent years, the light rail components of the system hemorrhaged passenger trips, while heavy rail components were more in line with New York MTA and Chicago CTA’s trends. 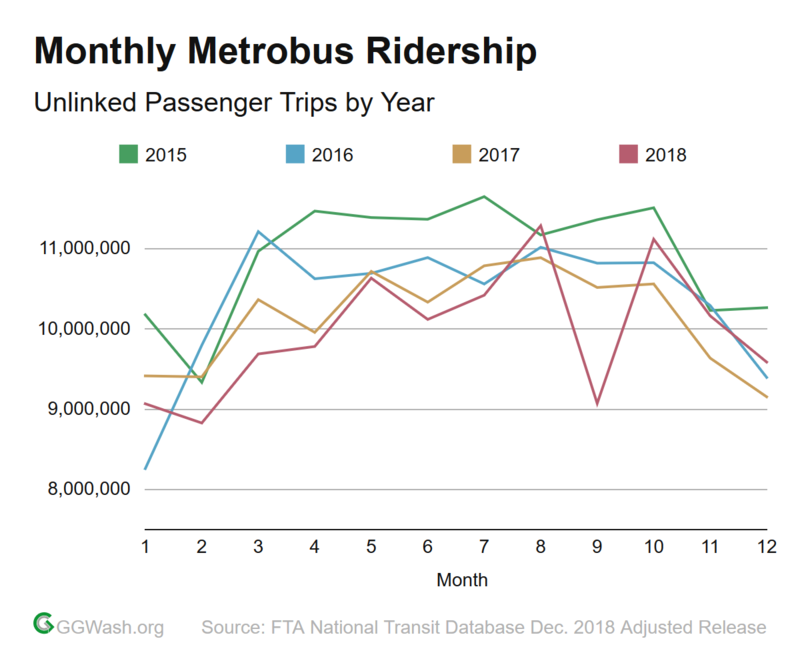 Perhaps the only silver lining in Metrorail’s ridership woes is that since 2016, the decrease in passenger trips has been minimal. In Boston and Chicago, the number of passenger trips peaked in 2014 and 2015, respectively. 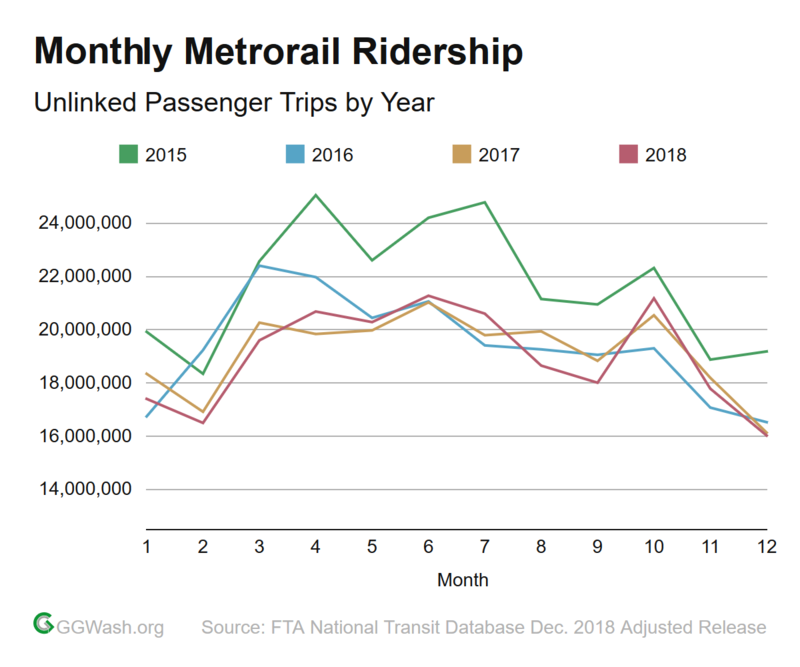 Accordingly, these rail systems have only had declining ridership problems for a few years, while Metro’s losses appear to be tapering off after a near decade-long slide. One important note about these graphs is that as a measurement, unlinked passenger trips are not totally interchangeable with ‘ridership.’ Since changing lines or modes counts as a separate trip using this terminology, passengers might be choosing to transfer less, rather than abandoning transit altogether. Nonetheless, for the time being, SafeTrack-era ridership habits appear to be the new norm for Metrorail, and to a lesser extent, Metrobus.